Wow, wow, wow. 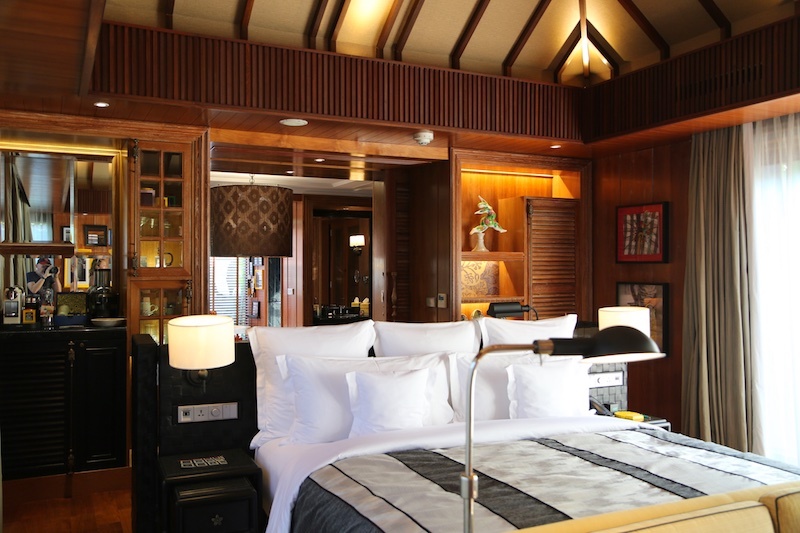 The warm tones, open spaces and eclectic details of Hotel Indigo Bali are something of a masterpiece. 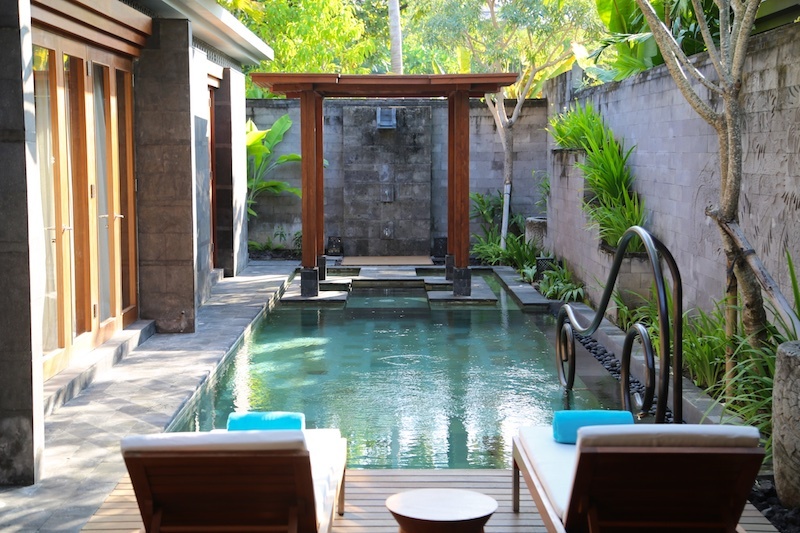 Décor has been thoughtfully hand picked to add just the right balance of warmth, colour, luxury and homeliness while maintaining and honouring the uniqueness that is Balinese artisanship. The main foyer represents a village gathering hall, complete with mismatching chairs – an authentic story of the individual chairs the villagers would bring to such meetings told with such simple elegance. Every item, every pattern and floor covering has some reference to Bali and its people, and they are presented in a playful way, with columns just slightly off centre and patchworked carpets, staff uniforms, and picture frames a nod to the humour of the Balinese people. Hotel Indigo is sympathetic to its surroundings and local culture yet still maintaining a five star feel, and a visual feast for the eyes. Nature is interwoven seamlessly, and although the hotel opened only 12 months ago, the garden was planted 3 years prior and is jungle-like and lush. Don’t be in too much of a hurry to leave the resort each day, there is so much to enjoy within the grounds of this oasis. We found the main pool the first day and enjoyed the cool vibes, hanging chairs, and casual poolside bar. But on the second day we discovered the secret garden! It could be hard to miss, but once you find it you will be glad it’s hidden from other guests. We came here everyday for 5 days and had it to ourselves a few times. Shaped in a long U, with whirlpools and couples cabanas set amongst the jungle-like greenery, there are plenty of places to feel alone with your love and a million miles from care. Shady trees and a helpful pool attendant will keep you cool by sheltering you from the hot sunny rays and refreshed with iced water. You feel like it’s your own tropical lagoon, with private butler service. We think the secret garden pool is the best – see if you can find it. You wont go anywhere else. Keep an eye out also for the massage chairs, we have never seen them in a resort. Can I just say from the outset, we enjoy a firm massage and these chairs deliver. We were lucky enough to visit these chairs several times during our 5 nights and each time we had them to ourselves. Do you judge a hotel by its breakfast? If so, you will be giving Hotel Indigo 5, or even 6 stars! We have had a lot of hotel breakfasts around the world but we were gobsmacked with the selection and quality of this one. The breakfast selection was enormous and fresh. Mark is a bit of a granola snob, he makes his own from scratch so he tends to be disappointed by the prepackaged mixtures on offer. For the first time we hit full marks for the granola. I think his eyes welled up after the first spoonful, finally he had found the granola holy grail. 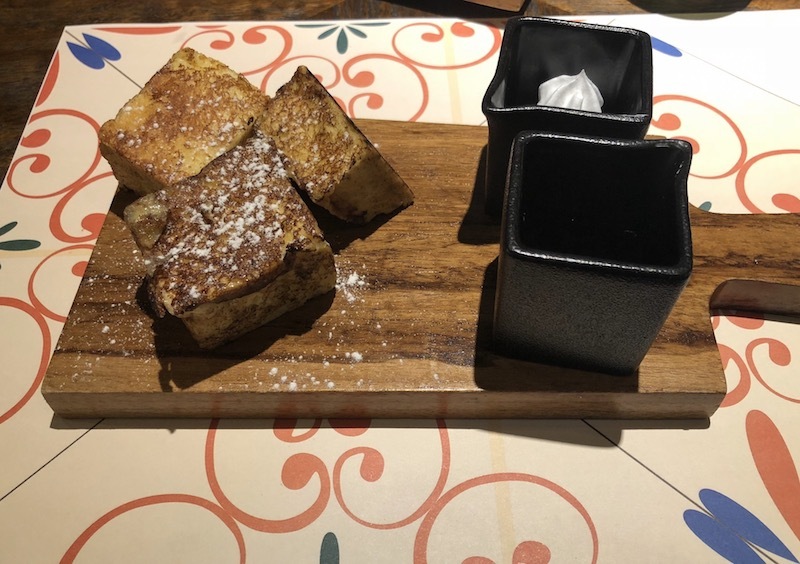 This was followed by french toast, again another must, 3 squares of perfectly soft and gorgeously presented french toast, with maple syrup on the side. Did someone mention french toast? They bake their own pastries (of course), offer fresh fruit smoothies of your choice and will cook you eggs any way you like. Faultless. 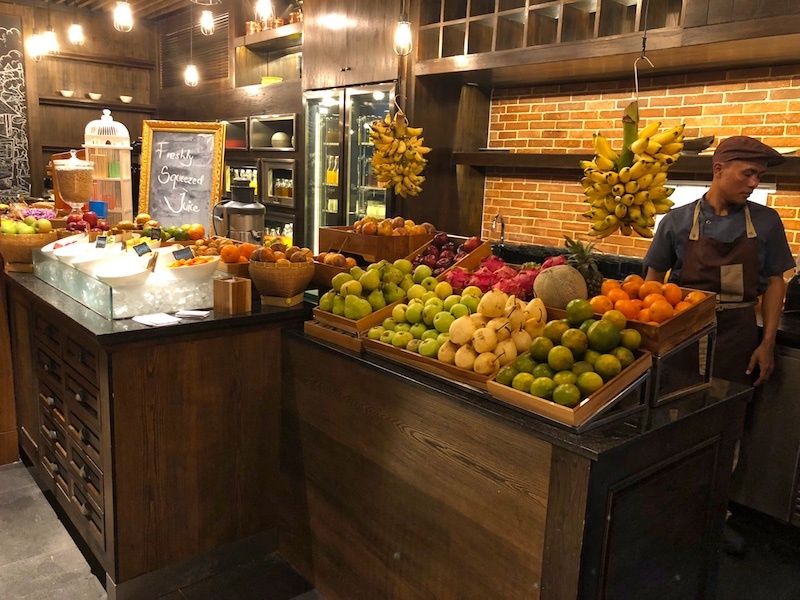 The breakfast stations were displayed as individual fresh markets of deliciousness, making the buffet experience enjoyable for a pleasant change. Pottery Café, within Hotel Indigo, roasts it own coffee and works with local suppliers to bring it’s guests both a variety of single origins and an exceptional blend called the Seminyak. If you’re not familiar with single origins they can be a little bitter, so we recommend the blend although the single origin we tried was top notch. The Seminyak blend was superb, a seriously great tasting coffee with a caramel aftertaste. A coffee connoisseur will be drooling over their double espresso each morning, as we were. Those who travel to Seminyak swear by Revolver coffee, but here it is, we are putting it out there – Pottery Café in the Indigo Hotel is the best coffee we have ever had in Bali. Every morning with breakfast we had 2 double shot espresso’s and if we weren’t so wired we would have had another – so good was this coffee. Kirsten said “you could easily live in these rooms” – they were huge. 50sqm, big king beds, good size balconies, large bathrooms, walk in wardrobes, a makeup area, large study desk – they were impressive. Until now, we have found the Westin (for us) has the most comfortable beds and pillows but we can now add Hotel Indigo to this list. Faultless. The one bedroom Villas were amazing! But again, it’s all in the detail. Mismatching picture frames, a bar that allows you to make your own cocktails…they even present a tray of local Balinese treats and teas for afternoon tea the day you arrive. We had a peek at the one bedroom Villas and they were enormous, with their own private pools in a serene location. Total blissful luxury, very special. The villa’s also come with their own pool. Right on the beach…need we say more? Ok then. 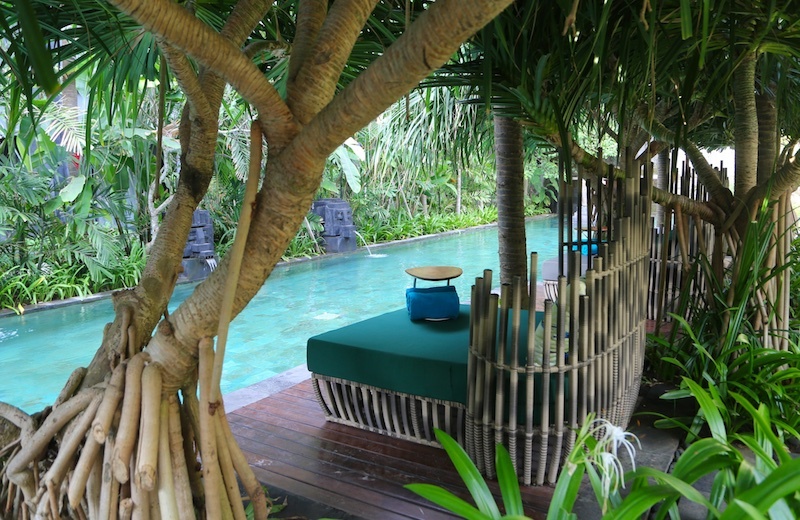 The location is in the quieter part of Seminyak, and to get to the busy shops and restaurants of Seminyak, it’s a $3 taxi fare – or the resort car can take you for free several times a day. Enjoy some amazing crafts, fantastic restaurants and of course a few massages while in town. Then come back. You don’t want to miss sunset on the beach at Breezes – the hotel’s beach bar followed by a swim in one of the pools. It is hard to get the recipe right when it comes to resorts. Hotel Indigo has 247 spacious rooms starting at 50sqm, 23 suites, 17 x 1 bedroom and 2 x 2 bedroom pool villas and at the time we stayed was at 70% occupancy. We were sure it was more like 30%, so well designed is this resort. It is large but with the feel of a boutique hotel, a real testament to the designers and architects of A49. IHG (Hotel owners) is a large chain throughout Asia and this was a prototype, a change of design direction and it sings. Some of their future plans will be based on this model, sympathetic to the local culture while creating an experience you simply don’t get in other resorts. We can’t wait to experience another Hotel Indigo. This is the sort of stylish, eclectic and culturally and environmentally aware luxury we like to indulge in. A big shout out to the staff were forever helpful and incredibly friendly completing our wonderful stay. Awesome job. Love the photos.